Bob Kaufman (April 18, 1925 – January 12, 1986), born Robert Garnell Kaufman, was an American Beat poet and surrealist inspired by jazz music. In France, where his poetry had a large following, he was known as the "black American Rimbaud." Born in New Orleans, Louisiana, Kaufman was one of fourteen children. 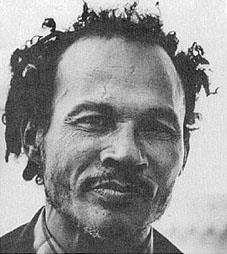 He claimed to be the son of a German-Jewish father and a Roman Catholic Black mother from Martinique, and that his grandmother practiced voodoo. At age eighteen, Kaufman joined the United States Merchant Marine, which he left in the early 1940s to briefly study literature at New York's The New School. There, he met William S. Burroughs and Allen Ginsberg. In 1944 Bob Kaufman married Ida Berrocal. They had one daughter, Antoinette Victoria Marie (Nagle), born in New York City in 1945 (died 2008). Kaufman moved to San Francisco's North Beach in 1958 and remained there for most of the rest of his life. He married Eileen Singe (1922–2015). in 1958; they had one child, Parker, named for Charlie Parker. Kaufman, a poet in the oral tradition, usually didn't write down his poems, and much of his published work survives by way of his wife Eileen, who wrote his poems down as he conceived them. Like many beat writers, Kaufman became a Buddhist. In 1959, along with poets Allen Ginsberg, John Kelly, A. D. Winans, and William Margolis, he was one of the founders of Beatitude magazine. According to the writer Raymond Foye, Kaufman is the person who coined the term "beatnik", and his life was filled with a great deal of suffering: In San Francisco, he was the target of beatings and harassment by the city police, and his years living in New York were filled with poverty, addiction and imprisonment. In 1959, Kaufman had a small role in a movie called The Flower Thief, which was shot in North Beach by Ron Rice. In 1961, Kaufman was nominated for England's Guinness Poetry Award, but lost to T. S. Eliot. He appeared on The Tonight Show Starring Johnny Carson four times in 1970–1971. I can remember driving down to North Beach with my folks and seeing Bob Kaufman out there on the street. I didn’t know he was Bob Kaufman at the time. He had little pieces of Band-Aid tape all over his face, about two inches wide, and little smaller ones like two inches long -- and all of them made into crosses. He came up to the cars, and he was babbling poetry into these cars. He came up to the car I was riding in, and my folks, and started jabbering this stuff into the car. I knew that this was exceptional use of the human voice and the human mind. His poetry made use of jazz syncopation and meter. The critic Raymond Foye wrote about him, "Adapting the harmonic complexities and spontaneous invention of bebop to poetic euphony and meter, he became the quintessential jazz poet." Poet Jack Micheline said about Kaufman, "I found his work to be essentially improvisational, and was at its best when accompanied by a jazz musician. His technique resembled that of the surreal school of poets, ranging from a powerful, visionary lyricism of satirical, near dadaistic leanings, to the more prophetic tone that can be found in his political poems." Kaufman said of his own work, "My head is a bony guitar, strung with tongues, plucked by fingers & nails." ^ Lindberg, Kathryne V. "About Bob Kaufman". Modern American Poetry. University of Illinois. Retrieved September 20, 2012. ^ Knight, Brenda (2000) "Eileen Kaufman: Keeper of the Flame," in Women of the Beat Generation: the Writers, Artists, and Muses at the Heart of a Revolution. New York: Conari. p. 103–114. ^ See Raymond Foye's introduction to Kaufman's The Ancient Rain: Poems 1956–78 (New Directions, 1981). ^ Winans, A.D. (May/June 2000) "Bob Kaufman." The American Poetry Review. ^ Digital Interviews (September 2000) Interview with Ken Kesey. Digital Interviews.com. ^ Foye, Raymond (March, 1986) "Bob Kaufman, A Proven Glory." The Poetry Project Newsletter..
^ Kaufman, Bob (1996 ) Cranial Guitar: Selected Poems by Bob Kaufman. Coffee House Press. Abbott, Steve. "Hidden Master of the Beats." Poetry Flash (February 1986). Anderson, TJ III. "Body and Soul: Bob Kaufman's Golden Sardine." African American Review (Summer 2000). Cherkovski, Neeli. Elegy for Bob Kaufman. San Francisco, CA: Sun Dog Press (1996). Cherkovski, Neeli. Whitman's Wild Children. Venice, CA: Lapis (1988). Christian, Barbara. "Whatever Happened to Bob Kaufman?" Black World 21 (September 1972). Clay, Mel. Jazz Jail and God: Impressionistic Biography of Bob Kaufman. San Francisco, CA: Androgyne Books (1987). Damon, Maha. 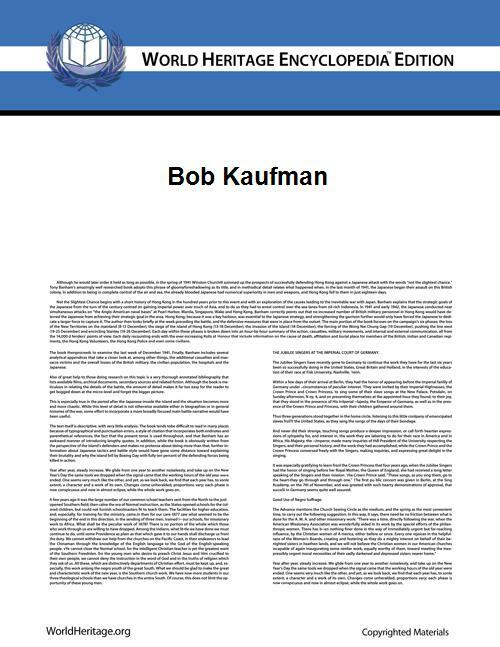 "'Unmeaning Jargon'/Uncanonized Beatitude: Bob Kaufman, Poet." South Atlantic Quarterly 87.4 (Fall 1988). Foye, Raymond. "Bob Kaufman, A Proven Glory." The Poetry Project Newsletter (March 1986). Kaufman, Eileen. "Laughter Sounds Orange at Night." In The Beat Vision: A Primary Sourcebook. Eds. Arthur Knight and Kit Knight. New York: Paragon (1967). Lindberg, Kathryne V. "Bob Kaufman, Sir Real." Talisman 11 (Fall 1993). Seymore, Tony. "Crimes of a Warrior Poet." Players Magazine (December 1983). Winans, A.D. "Bob Kaufman." The American Poetry Review (May/June 2000). About Bob Kaufman, by Kathryne V. Lindberg.